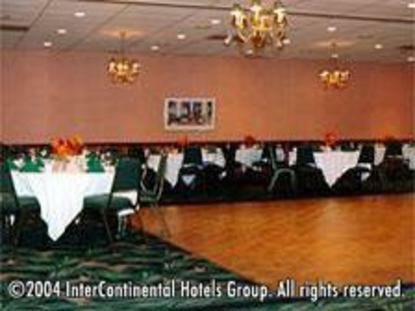 Holiday Inn Hotel Warren is a full service hotel with triple diamond rating by AAA, nestled in the beautiful Allegheny National Forest and located at the Junction of Rt. 6 and 62. The 110 newly remodeled rooms offer free high speed wireless Internet and free parking. Relax and enjoy cocktails by the fireplace in McGraw's Lounge, or relax in Tootsie's Garden Atrium offering a bistro menu with gourmet salads and sandwiches. You may also choose to unwind in Tootsie's Steakhouse, our white tablecloth restaurant offering a first class dining experience. The hotel features an indoor pool with a sauna and a fitness room. We offer banquet facilities for up to 300 people for meetings and events. Our professionally trained staff will execute your event to fit your needs. Your business is our pleasure. Holiday Inn Warren offers ample, free parking with a parking area for trucks, RVs and motor coaches. Golf Packages are available April-October. Come and enjoy one of our Getaway Packages available year round. Our hotel offers all the newest Priority Club promotions and packages. Priority Club members can earn Priority Club Points on every qualifying stay Look again, it&regs Holiday Inn This hotel is committed to providing accessible facilities under the American Disabilities Act. If your accessibility needs are not met, please contact the Hotel Manager on Duty. Should you require additional information regarding accessible facilities for guests with disabilities, please call 1-800-Holiday (U.S. and Canada) or contact the hotel directly. For the hearing impaired, TDD service is available at 1-800-238-5544 within the U.S. and Canada.